The idea is remarkably simple: [citizenFinerran]’s suit is made of a jumpsuit fashioned from fiberglass screening with several blank ID cards halved and glued to the suit. The cards are not glued on firmly, but hang in a way that allows them to move as the wearer walks. The motion of the cards creates a visual effect that appears as pixelation on surveillance footage. Though the designer referenced and “imitated” several different methods of creating the pixelated appearance, all of those methods were actually implemented via software on the camera, not by an external hardware solution. The closest thing to a working invisibility cloak in current development is the work of a team of students and professors at the University of Tokyo. 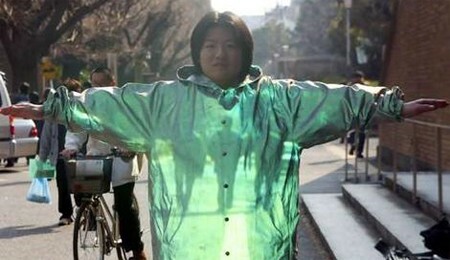 It uses a a coat made of retro-reflective materials, a camera behind the wearer, and a projector. The digital camera captures the scenery behind the wearer and projects it onto the front, creating a form of camouflage on an opaque surface that resembles true invisibility. It’s not without limitations, though, as the projector would have to move with the person wearing the coat to achieve mobile cover. Even then it would only work on one side of the coat, leaving the other side completely exposed. Not really feasible unless a full body display was created. If evading cameras is the goal, we feel a far more elegant fix is simply to cover your face with a hood or a gas mask. In addition to keeping your identity secret, a hood actually lines up with the philosophical imperatives behind [citizenFinerran]’s project very well, and it’s less likely to get you beaten up. This reminds me about the textfile about robbing ATMs that I read a long time ago. It mentioned a rumor that wearing an aluminum-foil headband could somehow confuse the security camera. something about the lens coatings or something. anyway I made an aluminum-foil headband right away and wore it to skool every day for a week. 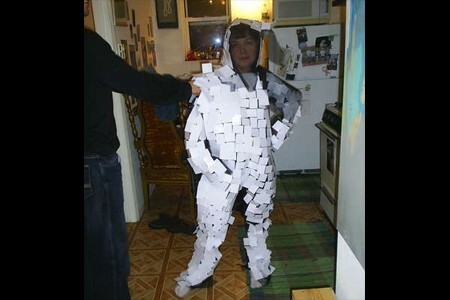 It’s a scramble suit… for video cameras! OMG… it’s… NOT a hack! Yet another lame infomercial on the increasingly inaccurately named “HackADay”. File it under ‘Misc Hacks’ with the other 659 so called hacks no-one cares about. I don’t really see the point of the first one, unless the large amount of movement will mess up video compression- on raw video you just look like someone covered in index cards. If it covers your face then obviously your face cannot be seen but there are easier ways to achieve that. The Instructable seems to be more of an art project, a philosophical statement and a commentary on ubiquitous surveillance than an actual “hack”, and I didn’t actually see any unadulterated video of the suit in use. The retroreflective “cloak” is the only particularly interesting piece of technology, and it’s still utterly useless for stealth purposes because it needs a projector and camera setup at the viewer’s end. I was more interested by the suggestion it be used to give surgeons transparent hands. 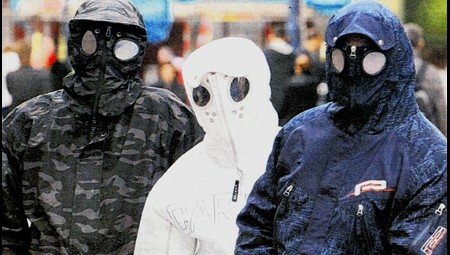 I appreciate the greater number of posts recently, but seriously- gas mask hoodies? I love this site for the “quality over quantity” approach, please keep it up. Covering your body with white cards will *not* fool decent cctv systems, you’ll just look stupid. “If evading cameras is the goal, we feel a far more elegant fix is simply to cover your face with a hood” wow, thank you captain obvious. way to insult hackaday readers’ collective intelligence. If you want to mess with a camera just wear stripes. I know from working the video cameras at church that stripes can really mess with a camera. It won’t completely obfuscate you, but it can do some major damage to the quality of the footage.